My spouse, Bruce, has been the Associate Pastor for Community Ministries at a church in Dallas for 30 years. When we first arrived we learned that the Fourth of July event hosted by the church’s senior activities group was “a must.” To us northerners it was more than strange that anyone would choose to be outside in 100° temperature on July 4. On top of it, and to my dismay, the event was centered on chicken. But there was the issue of the chicken. This needed to be addressed. So I began serving vegan drumsticks. I bought them from my local vegan Chinese restaurant. She stocked them in bags of 80. They are little pieces of seitan on a cane sugar stick. I would slather barbecue on half of them and olive oil on the other half, bake them and serve them. They were a huge success and a curiosity. Everyone adjusted to the change in the main course and the request to bring vegetables or fruit (and no meat). What I was preparing became a matter of interest. This picture shows my most successful barbecue—barbecued unribs! 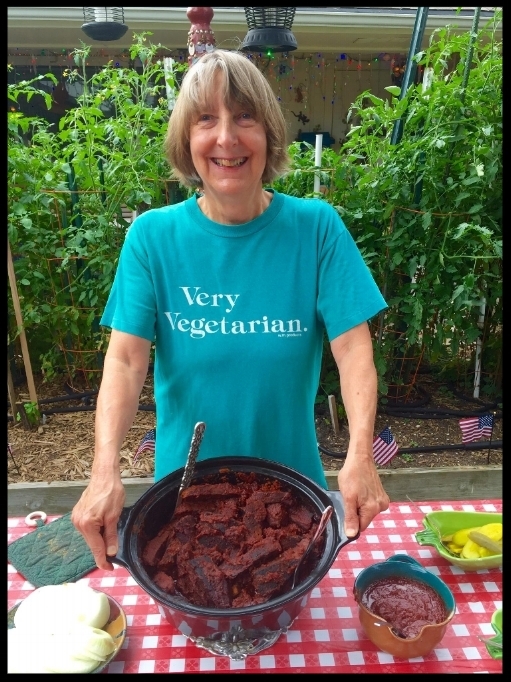 The author with her popular BBQ unribs! A faster BBQ recipe uses jackfruit instead of seitan. You hardly need any time at all! A barbecue is incomplete without macaroni and cheese, and I created the most luscious, richest, outrageous vegan mac and cheese recipe. I added a little kale just to prevent its complete descent to decadence. One friend, a nonagenarian, and very proper Southerner, went back for thirds! You can find the recipe here. Of course, some cole slaw is necessary. Finally, we always end with a Texas sheet cake. If I mention ordering a cake, there are protests: this is the cake that must complete the bbq. As people are finishing their meals, Bruce brings out his miniature cannon and sets it off. But that is another story. The vegan bbq has found its place in the hearts and stomachs of at least one Texas congregation. Why stop there? Carol J. Adams is the author of numerous books including The Sexual Politics of Meat: A Feminist-Vegetarian Critical Theory, now in a Bloomsbury Revelations edition celebrating its 25th anniversary. She has written several books on living as a vegan, including Never Too Late to Go Vegan: The Over-50 Guide to Adopting and Thriving on a Vegan Diet (with Patti Breitman and Virginia Messina), Living Among Meat Eaters: The Vegetarian’s Survival Guide, and How to Eat Like a Vegetarian Even if You Never Want to Be One.